Berkery Noyes Represents BNP Media In Acquisition Of Ascend Media’s Professional Services Division - Berkery, Noyes & Co., LLC. New York, NY, August 31, 2007 — Berkery Noyes, the leading independent investment bank serving the information, media and technology markets, announces that it represented BNP Media in its acquisition of the Professional Services Division of Ascend Media. Terms of the transaction were not disclosed. 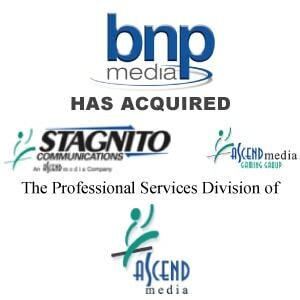 The assets acquired by BNP Media include the Food, Beverage and Packaging Group and the Gaming Group of magazines, conferences, web sites and tradeshow, which together formed the Professional Services Division of Ascend Media. The acquisition coincides with entry into these markets by Clear Seas Research, BNP Media’s market research company, and offers a compelling strategic fit in an industry that increasingly relies on hard research data to support advertising and marketing spend. The addition of these assets makes BNP Media the global leader in food, beverage and packaging information. BNP already owned the Prepared Foods and Food Engineering titles, along with Packaging Strategies, a conference, newsletter and multi-client report business. The Food, Beverage and Packaging Group, based in Deerfield, Illinois, are vertically integrated food industry and retailing information businesses which are accessible to customers through a combined marketing, advertising and rate program available to take advantage of targeted market penetration. The Gaming Group is based in Las Vegas, Nevada, and is comprised of two leading magazines and the industry’s premier trade shows and events. Berkery Noyes acted as financial advisor to and assisted in the negotiations on behalf of BNP Media. BNP Media, the nation’s largest family-owned B2B media company, provides business information through a portfolio of magazines, websites, conferences, tradeshows and market research. BNP specializes in the food, beverage & packaging, manufacturing, gaming, architecture & construction, mechanical systems, and safety & security markets. BNP Media is headquartered in Troy, Michigan, with offices around the country. For more information, visit www.bnpmedia.com. Ascend Media was formed in 2002 by founding partners that included Cameron Bishop, President & CEO, and Ron Wall, Executive VP Sales & Marketing, in partnership with CCMP Capital (formerly J.P. Morgan Partners) and Veronis Suhler Stevenson. Funded for rapid growth, Ascend Media is positioned as a leader in the business-to-business media environment – with a unique focus on medical, healthcare and business services industries. Based in New York City, Berkery Noyes provides strategic mergers and acquisitions transaction advisory services, financial consulting and strategic research to middle market media, information and technology companies in the United States and internationally. For more information, visit www.berkerynoyes.com.